In most industries, mechanical reliability is an essential quality for thin film coatings. 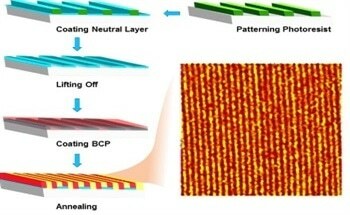 The accurate screening of mechanical properties and high throughput process are imperative for rapid production of single and multi-layer coatings. Mechanical properties can be quickly and accurately measured measured using Bruker’s Hysitron nanoDMA® III with CMX routines as a function of depth into the surface of the material. CMX stands for Continuous Measurement of X, where X can be tan-delta, loss modulus, storage modulus, hardness and much more. With CMX routines, dynamic contact stiffness can be measured directly and continuously during any stage of an indentation test, while small volume deformation can be effectively observed with less impact to thermal drifting. This article presents the results of screening the mechanical properties of combinatorially deposited Transparent Conducting Oxide (TCO) thin films, demonstrating the efficiency and accuracy benefits of the nanoDMA® III with CMX routines. The mixed metal oxide combinations of TCOs have low resistivity as a result of the collective effects of carrier concentration and electronic mobility. Moreover, they show inferior optical absorption in the range of visible light. They are used in electrochromic devices, transparent thin film transistors, displays and photovoltaics. For photovoltaic applications, new TCOs are explored with focus on improving the conductivity without compromising optical transparency. Combinatorial deposition of TCOs enables rapid creation of ‘libraries’ covering a host of compositions on a single substrate. The combinatorial synthesis of a TCO thin film on a 2” x 2” substrate is depicted in Figure 1. Probing the thin film at 44 positions showed 44 different compositions for the structural, mechanical, optical and electrical properties. Figure 1. Combinatorial library, spread of composition of indium-zinc-tin-oxide (In-Zn-Sn-O) thin film by co-sputtering of indium oxide, zinc oxide, and tin oxide targets on 2”x2” glass substrate. The nanoDMA III with CMX routines was used to measure the hardness and reduced elastic modulus of these In-Zn-Sn-O thin films, followed by a comparison with results of quasistatic indentation. Displacement- control mode was used to conduct quasistatic indentations over contact depths in the range of 15-100nm. Dynamic testing was carried out over the same contact depth range but at a constant strain rate and 220Hz frequency using CMX. During indentation, the substrate effect was lowered by using only the top 5-10% of the total thickness (350±20nm) of the film as a contact depth to analyze data. Figures 2a and 2b present the measurement results of the dynamic and quasistatic indentations for the hardness and reduced modulus, respectively. The nanoDMA III with CMX screened all 44 positions with four dynamic indentations per position within 11h. For quasistatic indentation, the total time taken to measure similar data over the depth range of interest was roughly 200h. Figure 2. 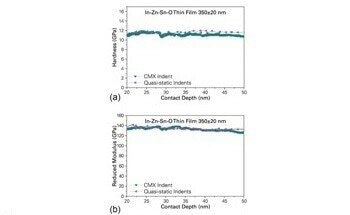 (a) Hardness and (b) reduced modulus with contact depth in indium-zinc-tin oxide (In-Zn-Sn-O) thin film measured with quasistatic indentation and dynamic indentation. This proved that the speed of CMX is over one order of magnitude higher than traditional quasistatic indentation. 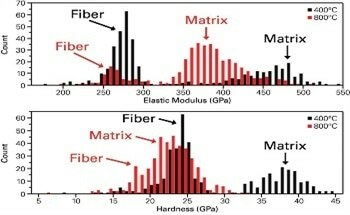 Quasistatic indentation yielded a measured value of 11.7±0.2GPa for hardness and 134.0±2.7GPa for reduced modulus. The respective average values of hardness and reduced modulus over the four dynamic indentations were 11.3±0.4GPa and 133.9±2.8GPa. These results are in line with the dynamic indentation testing results. As shown in Figures 3a and 3b, the composition-structure-property relationship can be determined by referencing the mechanical properties of two different combinatorial libraries to composition. The triangle illustrates the changes in the mechanical properties with respect to the different cationic composition of In-Zn-Sn-O thin films. The hardness with a variation of 15-25% seems to be higher in the case of lower indium content (error ˜ 5%), whereas the reduced modulus with a variation of 7-12% is independent of the composition (error ˜ 5%). Figure 3. (a) Hardness and (b) reduced modulus of two In-Zn-Sn-O thin film combinatorial libraries deposited on glass substrate using RF magnetron co-sputtering from three different ceramic targets of In2O3, ZnO, and SnO2. The results show that the mechanical properties in a system can be accurately and rapidly screened using the nanoDMA III with CMX, complementing next-generation materials development.